More than 300 easy, fun, and creative recipes for the hottest new kitchen appliance—the air-fryer! The air-fryer is an easy, healthier alternative to conventional fryers, and it’s quickly becoming the latest kitchen must-have! The Everything Air Fryer Cookbook teaches you all you need to know about this hot new appliance, proving that fryers can be used for so much more than French fries and onion rings. Learn how versatile an air fryer can be, with recipes such as Nashville Hot Chicken, to Baked Garlic Parsley Potatoes, to Fried Banana S’mores! With more than 300 quick and tasty recipes—including vegetarian and vegan options, as well as classic favorites like fried pickles and jalapeño poppers—there’s an air fried meal for every taste, diet, and mood. Whether you’re looking for an easy breakfast dish, a scrumptious snack, or a delicious dinner for the whole family, you can find it in The Everything Air Fryer Cookbook. "We all have someone on our list who is a foodie fanatic, so it’s only right to have a gift or two ready for them. If they have an air fryer at home ... 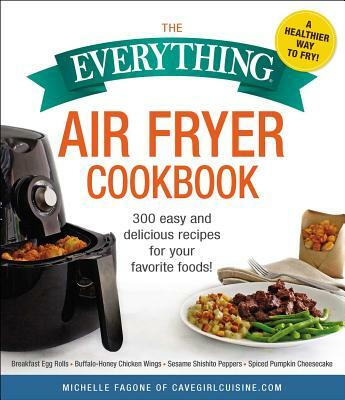 The Everything Air Fryer Cookbook by Cavegirl Cuisine features more than 300 easy, fun, and creative recipes." "Having, and using an air fryer to me is a must. I don't even own a traditional oil fryer because using an air fryer has so many more benefits. No more no added (and unwanted) grease to my foods and no more grease spatter messes. Using an air fryer is so simple and can be used with pretty much any food out there."